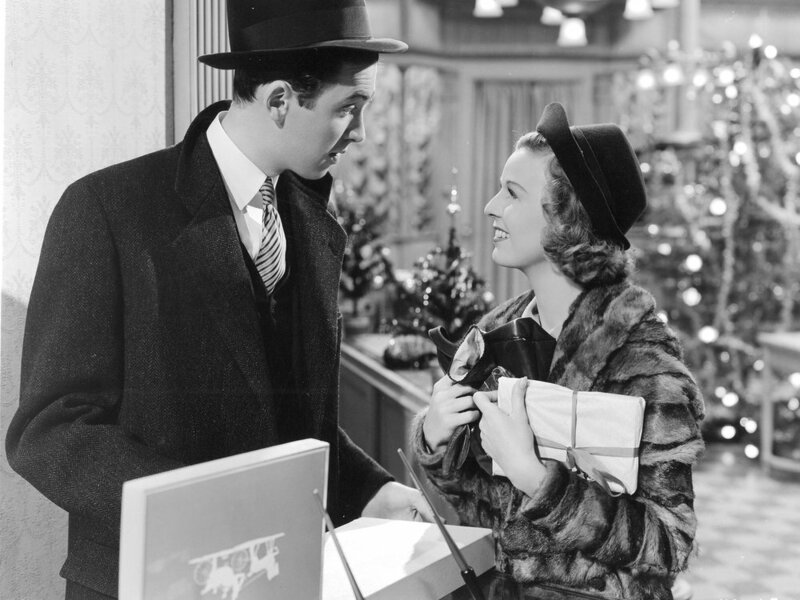 The Shop Around the Corner is an extremely influential black and white romantic comedy. It's based on the same source material that was updated and adapted into "You've Got Mail," which I should probably watch one of these days. Like most movies of its era (or at least the ones that have endured), The Shop Around the Corner is a bit complicated. It's well regarded - Rotten Tomatoes has it at 100% - but it's also dated. Do I even need to say that the gender politics in a movie made in 1940 are less than ideal? I suppose they could be a lot worse. The male lead manipulates and lies to the woman for half the movie, and in the end, she's just glad to end up with him. But aside from that, she's generally portrayed as intelligent and capable. The premise requires that the two fall in love with each other's minds, rather than their bodies, though there are definitely some awkward jokes around their concerns as to what their mysterious love interests look like. But I'm getting ahead of myself - let's back up and talk plot, premise, characters, and all that. The movie's set in a department store in Hungary, with the vast majority of the story taking place (you guessed it) during the Christmas season. The two romantic leads are Alfred Kralik and Klara Novak, played by James Stewart and Margaret Sullavan. There are a number of other minor characters, but the only one who feels like more than a plot device or occasional joke is store owner Mr. Matuschek, played by the Frank Morgan, the great and powerful. Unbeknownst to either of them, Kralik and Novak are anonymously corresponding with each other through letters. All they know is they're each writing to someone who shares their emotional outlook. Essentially, this is the 1940's equivalent of meeting someone online and getting to know them without meeting in person (hence the existence of You've Got Mail). The irony is that the two are basically enemies in person. Novak works under Kralik and finds him simplistic and boring. Kralik, meanwhile, considers Novak disloyal and cruel. His opinion of her changes when he discovers her identity. If you think he's above using this knowledge to torment and manipulate her, you weren't paying attention in the second paragraph of this review. Meanwhile, Matuschek discovers his wife's having an affair with one of his employees and assumes it's Kralik, a man he'd long trusted as almost a son. Feeling betrayed, he fires Kralik before discovering the truth. Then he tries to shoot himself, but is thwarted by the movie's comic relief. He repairs his relationship with Kralik, who's rehired and placed in charge of the store right before Christmas. After torturing Novak and masterminding her gift selection, Kralik finally reveals he's the anonymous correspondent. It's Christmas, sales are great, and everyone lives happily ever after, so long as you don't think about it too hard. From the perspective of someone watching this almost eighty years later, the movie comes off very mixed. The first half - maybe even the first two thirds - are fantastic. The comedy holds up extremely well, and the character work is top notch. It's also fascinating to see romcom tropes established and deconstructed in real time. Forget You've Got Mail - I couldn't watch the leads interact without seeing prototypes of Sam and Diane. Plus, unlike almost all of its imitators, this movie is conscious of and addresses one of the fundamental issues with its genre. The story is about the way we build unrealistic expectations for imaginary partners and risk failing to see real opportunities in front of us. In short, it's a romantic comedy about the negative impact romantic comedies can have on viewers. That said, the movie has issues balancing contrasting tones and ideas. It has some beautifully dark moments when we're shown a window into a character's pain, but - as good as these sequences are - the film can't maintain them. The most obvious examples concern Matuschek. The moment of his attempted suicide is surprisingly dark, but it shifts to comedy far too abruptly. Likewise, the movie shows us the sense of alienation tormenting Novak, only to make light of it by expecting us to be entertained by Kralik's games. This is at its worst in the closing moments of the movie, which drag out the dramatic irony for as long as possible. The scene aims for farce when it should simply embrace romance, and it detracts from the effect. Still, this is absolutely a solid romantic comedy I'd recommend to anyone interested in the genre's history. Most viewers under the age of 60, however, would probably find this a tad dated. There's not a lot here, and most of what is present is fairly obvious. You won't be surprised to learn this culminates on Christmas Eve, given this is about the employees of a department store (not THAT much has changed since 1940). They play with themes of renewal and hope, and of course you can't help but feel there's just a pinch of holiday magic in the air along with the requisite snow. There's also the obvious implied conflict over whether characters will be alone or with loved ones at Christmas. This question framed the love story, of course, but it also formed the resolution of Matuschek's arc. Personally, I'd have preferred if they'd left him on a more somber note, rather than giving him a comedic closing moment. But while this was willing to examine its tropes, it wasn't willing to push the boundaries of comedy, so every "good" character gets a happy send-off. Like I said, this is very good, and in some ways, it's ahead of its time. But ultimately, there's a little too much rooted in outdated writing conceits and adherence to convention. It is good - maybe even great - but it's still a product of its time.